The food you give your dog has a big impact on their health, happiness and well-being. This means that as a dog owner and lover you’ll want to give them the best food you can. 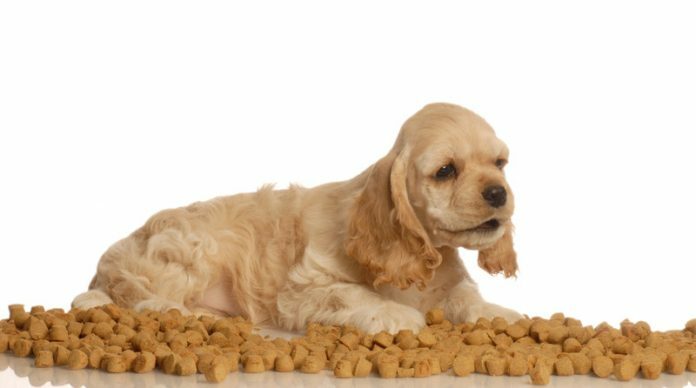 The easiest way to make sure your dog gets a well-balanced meal is to feed them a quality kibble from a respectable brand. So with that in mind, let’s take a look at some of the best dry dog food on the market. When reading these reviews, please bear in mind that no single dry dog food will be suitable for all dogs. Just like we humans, dogs have their individual tastes and foibles and what some dogs love, others will flat out refuse to eat. And some sensitive dogs will have reactions to some foods that others are just fine with. So I recommend you try out different brands and flavors to find out which food is best for your own dog. And remember when switching your dog to a new food, do it slowly so as to minimize any chances of an upset tummy and loose stools. At the time of writing (May, 2017), this is the number one best selling dry dog food on Amazon and watching my dogs eat it, it’s easy to see why. They love it and wolf it down! Of course, if given the chance they also love lots of stuff they shouldn’t really eat so you can’t take that as a complete recommendation. 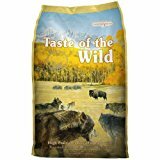 That said, you don’t need to worry about feeding them this Taste of the Wild food as it’s packed with real meat and vegetables and fruits. It’s also completely grain-free, which is great if your dog has allergies and/or sensitive skin. The kibbles are plenty small enough for small dog breeds but also fine for larger dogs. There are varieties to suit all tastes, e.g. bison & venison, boar, lamb, salmon, venison and wildfowl. Bag sizes range from 5 pounds to 30 pounds. The Blue Wilderness high protein dry dog food is another that’s grain-free and an excellent choice of food for dogs with skin allergies. As the name suggests, it’s full of meat and hence protein. It also includes what Blue Wilderness call “LifeSource Bits”. This is basically a mix of vitamins and minerals along with anti-oxidants, offering even more health benefits to your dog. It comes in a wide range of flavors and there are options for different size dogs, e.g. toy breeds, small breeds and larger dogs. This is one of the best grain-free small breed dog foods for promoting healthy muscles and bones. One of the best high protein dog foods, Wellness CORE aims to provide as much meat as possible in accordance with the practice of a raw food diet. Indeed, Wellness claims this product contains more than 80% more meat than standard commercial dog food. There are a number of different flavors available aimed at puppies, small breeds and large breeds. None of them contain any artificial flavors or coloring, or for that matter soy, wheat, corn or any other fillers. It also doesn’t have any beet pulp in it – a notorious cause of constipation and hard stools. The Wellness CORE range is a great choice if you’re looking for a high protein dry food for your dog, and is another food that is heartily recommended by my own dogs! If you want to make a contribution to a good cause at the same time as buying your dog food, then consider the Rachael Ray Nutrish Just 6. Part of the proceeds from every sale go to the Rachael Ray Foundation which donates to pet charities and other animal organizations. Of course, that’s not a good enough reason to buy a dog food in its own right, but this is an excellent and nutritious food that will help to keep your dog healthy. So you can give your dog a healthy meal while feeling good about yourself at the same time. Full of natural, high-protein ingredients, it doesn’t have any fillers, artificial preservatives or flavors. The kibble is quite small and is perfectly suitable for small breed dogs. Cheaper than some of the other dry dog foods reviewed here, this makes a great budget option for those with limited resources. If you’ve got a number of dogs at different stages in life then the CANIDAE All Life Stages dry food is definitely worth looking at. The fact that it’s suitable for dogs of all ages from puppies to senior dogs means you won’t have to mess around feeding different dogs different foods and worrying about them eating the wrong ones. Like the other foods discussed here, it’s full of quality real meat as well as vegetables, vitamins and minerals. All the ingredients are natural with no artificial additives, grain, corn, soy or wheat. As well as being aimed at dogs of all ages, it’s also suitable for dogs of all sizes and breeds too. So it makes life easier if you’ve got a number of different breed dogs as well as ones of different ages. “You are what you eat”. This is true of dogs just as much as humans and it’s important to give your dog the best dry dog food you can. All of the ones reviewed here are top quality products from well-known and respected brands and will help to keep your dog healthy and full of energy. As mentioned earlier, dogs can react in different ways to foods and especially to changes in their diet, so always take care when switching your dog to a new food.